Among the photographs I took of the dilapidated parking lot the other day, was one that captured a color now rarely seen in lots for parked cars. 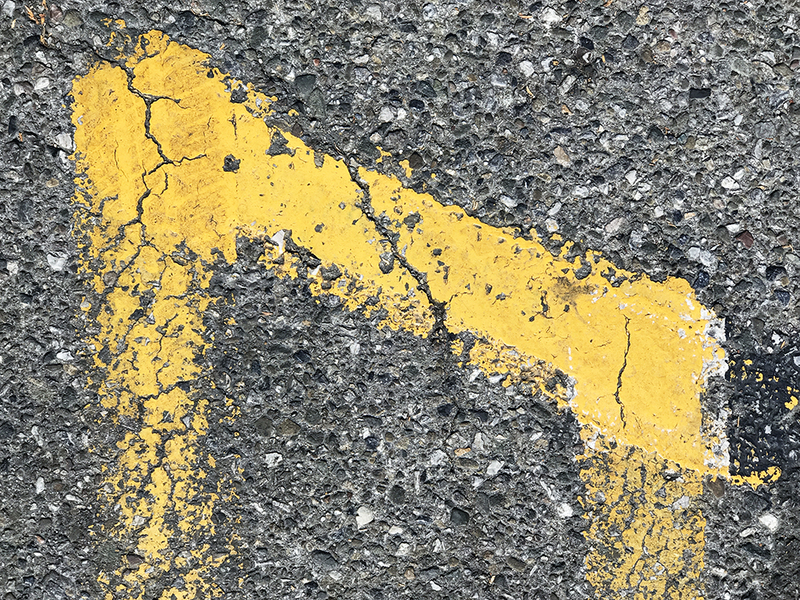 Yellow is a common color for lines on roadways. There are the omnipresent solid double yellow lines in the center of busy highways that one must not cross under any circumstances; dotted yellow lines that one may cross if necessary; single yellow lines on the side of the highway (whose meaning I don’t know). I was grateful to get a leisurely view of this luscious color in a place where traffic is not zooming by. It is much less harsh than the white parking-space-divider line. These particular yellow line segments blend nicely with the rough, rocky surface on which they are painted. This entry was posted in Personal Stories and tagged abstract art, artistic process, creativity, parking lot, photography, rarity, street photography, visual arts, yellow lines, yellow paint. Bookmark the permalink.